กระดาษทดสอบ Cobalt ions (Cobalt test paper) | Higher Enterprises Co.,Ltd. 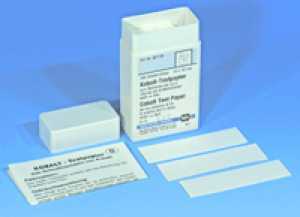 This test paper allows the quick and easy detection of Cobalt (Co2+). For non-destructive testing of materials apply a drop of acid solution (50 ml hydrogen peroxide 3 % + 7.5 ml o-phosphoric acid 85 % + 5 ml hydrochloric acid 37 %) to the degreased surface. After 30-60 seconds absorb the liquid with the test paper. In the presence of cobalt a blue color appears. The intensity of the color varies according to the concentration. With this procedure Cobalt contents >0.5% are safely detected.